How does a Community Room fit into a Tiny House Community? Tiny Tours, that sounds cool, what is it? It is just that! A small admission fee allowing people to tour the Tiny House Community. This would help fund the community – whether to help build more Tiny Homes, maintenance on the Community Garden, property taxes, and more. This blog is a continuation of our previous blog Tiny House, Big Vision : Why this? How will this benefit our Tiny Housers? Along with housing costs, food is typically a huge monthly expense. We believe a community garden will help our efforts in reducing our Tiny Housers living expenses, in turn, leading to greater financial freedom. 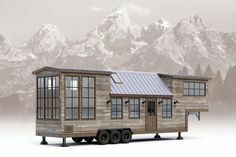 Tiny House, Big Vision : Why this? Why a Tiny House Community? This is quite literally an ever evolving dream of ours. Tiny House Update: LOTS have been going on.